Here we go! The time has come! Some of you may or may not remember this, but, in celebration of my fifth year of blogging, I decided to take up the 30-Day Anime Pick 5 Challenge! 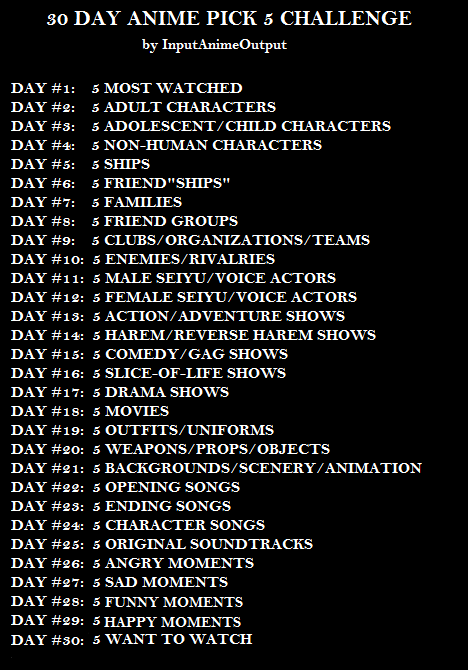 This entry was posted in 30-Day Anime Pick 5 Challenge, Anime and Cartoons, Challenge Accepted. Bookmark the permalink. Love it. Looking forward to your answers. Nice twist with the 5 picks. Interesting twist! Looking forward to it!